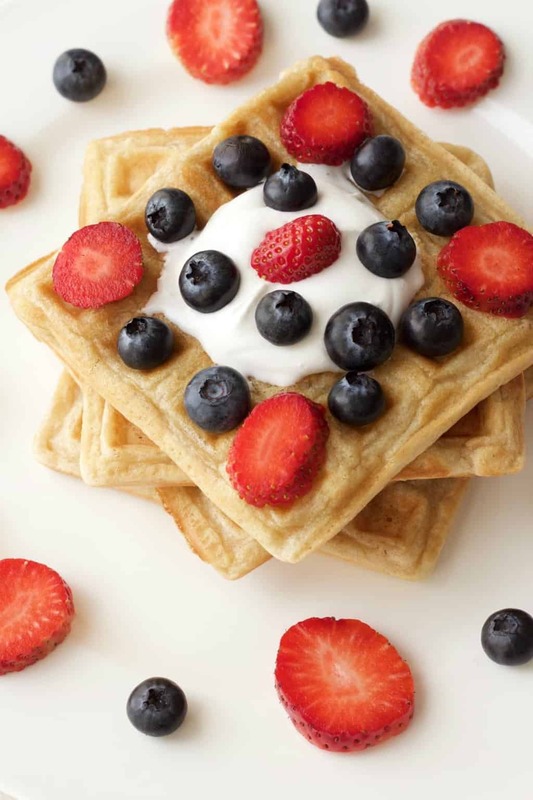 Classic vegan waffles, beautifully golden in color and crispy on the outside, soft on the inside. Delicious with vegan whipped cream, fresh fruit and syrup. 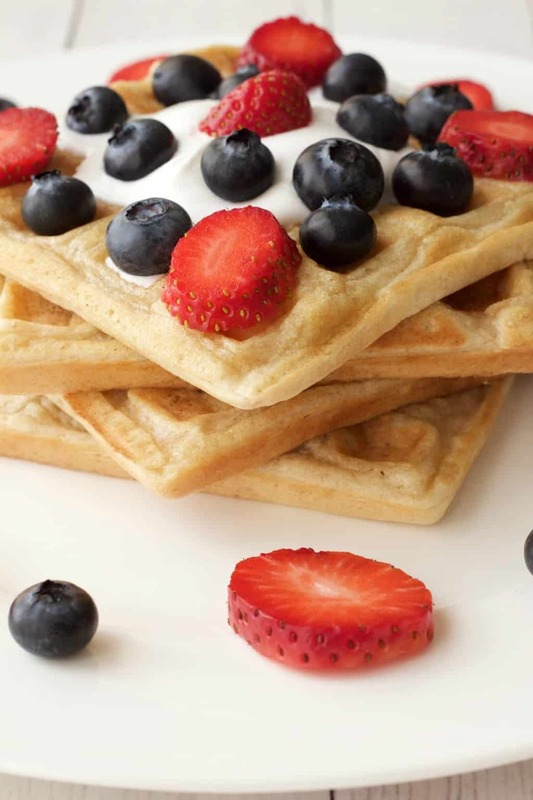 I’ve been a big fan of waffles since I was 14 and working in an ice cream parlour. One of the items on the menu was waffles topped with ice cream. The batter was pre-made so all I had to do when I received an order was to pour out the batter into the waffle maker and then leave it for a set amount of time, then put it on a plate, top it with soft serve and take it to the customer along with a choice of syrups. This was my first introduction to the magic of waffles! As you may already know, I have a serious sweet tooth, so the ice cream parlour job was my favorite of all the jobs I had as a teenager. I also worked in a video store (also fun but it wasn’t ice cream) and as a cashier in a supermarket (least fun). I was also excessively generous on the portion sizes. What can I say? Not much has changed in that respect! 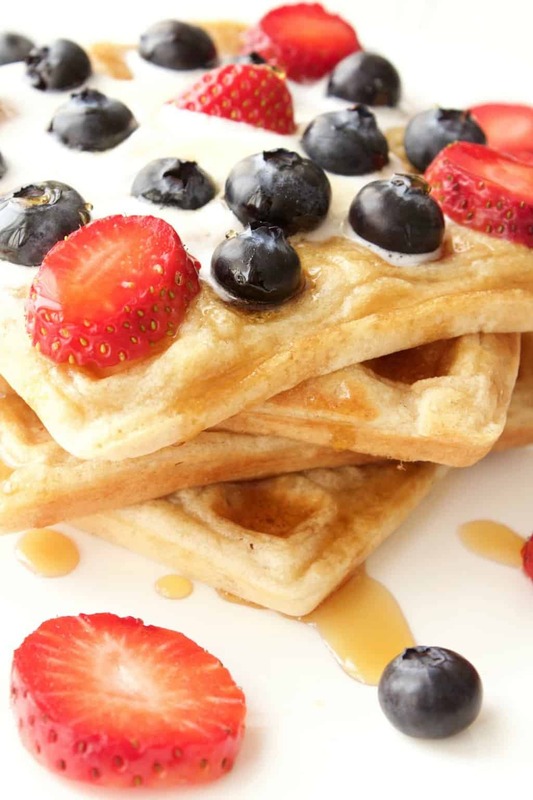 These vegan waffles are just as delicious as those ice cream parlour waffles back in the day! And they’re divine served with vegan whipped cream or vanilla ice cream, syrup, fresh fruit or whatever you fancy. We went with vegan whipped cream, blueberries, sliced strawberries and maple syrup. It was seriously good. 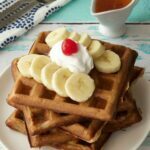 This is a classic vegan waffles recipe, it’s not flavored any particular way, but the result is vegan waffles that are golden brown, crispy on the outside and beautifully soft on the inside. These waffles were golden brown in 5 minutes, but we did splash out and get a rather lovely waffle machine! I think a less powerful model might require a little more time, but waffles are one of those things that you generally have to check on as they cook anyway. 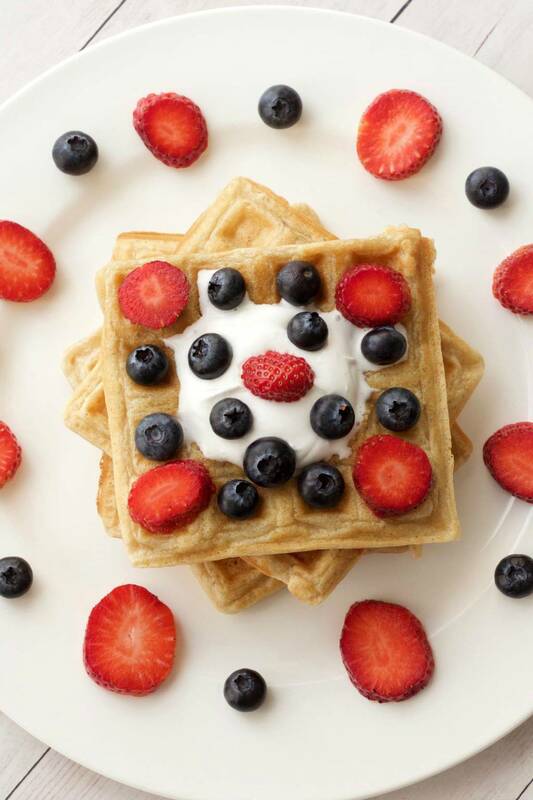 Dessert and breakfast in one! Serve them hot and crispy for the most delicious results. 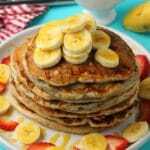 More delicious vegan breakfast recipes! 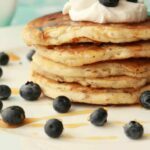 Our vegan pancakes, vegan banana pancakes and vegan blueberry pancakes are not to be missed either! Also check out our super eggy vegan tofu scramble, our vegan omelette and our vegan French toast. Our vegan hash browns are also really satisfying and delicious. 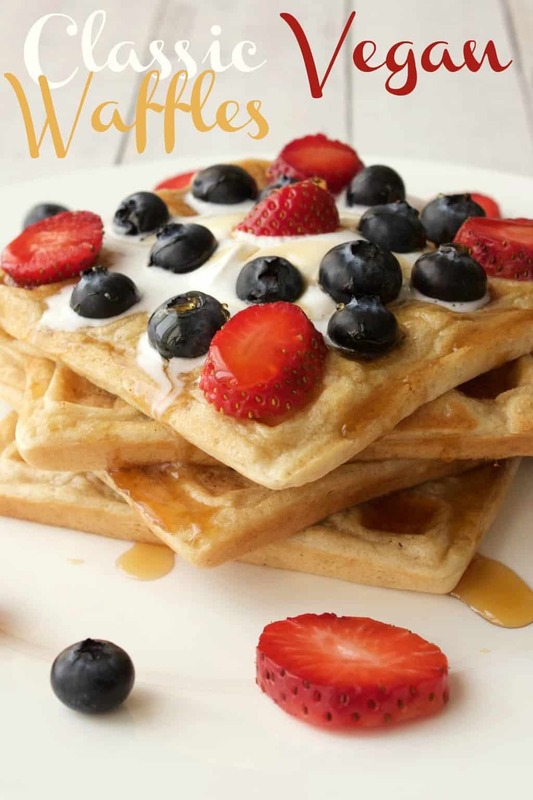 So let me know what you think of these delish vegan waffles! Leave a comment down below. And if you make this recipe, be sure to rate it and let us know how it worked out! And definitely sign up to our email list, you’ll be sent a lovely free recipe ebook and you’ll stay up to date with all our latest recipes on the blog. 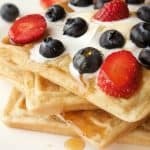 These classic vegan waffles are beautifully golden in color, crispy on the outside, soft on the inside and simply delicious served with vegan whipped cream, fresh fruit and syrup. Sift the flour into a bowl and add the baking powder, salt and sugar. 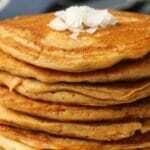 Then add the soy milk or other non-dairy milk, coconut oil and vanilla and whisk with a hand whisk to remove any lumps. The batter will be quite thin. Allow to cook for 5-7 minutes until golden and crispy. 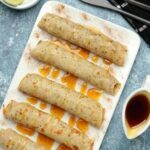 Serve with whipped coconut cream or vegan ice cream, fresh fruit and maple syrup. 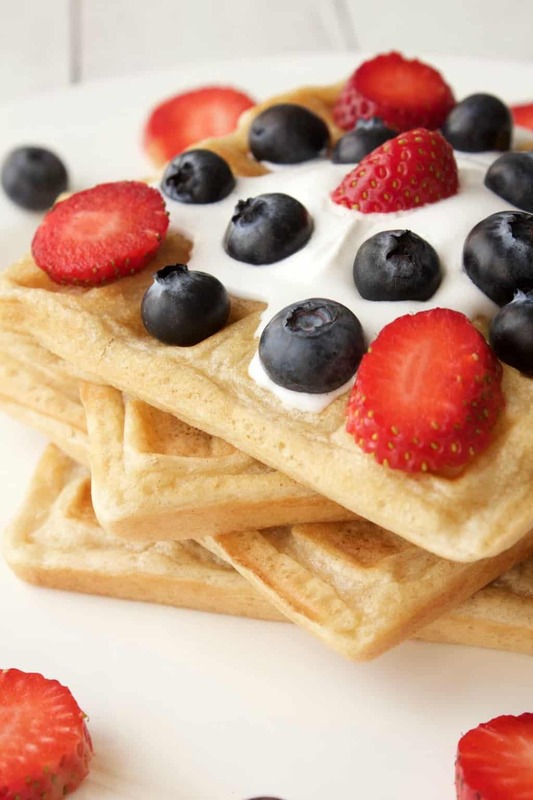 *Nutritional information is based on 1 waffle of 4 without any toppings. 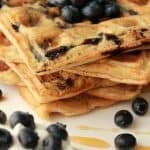 *You might get more waffles out of this recipe, depending on the size of the waffle iron you are using. 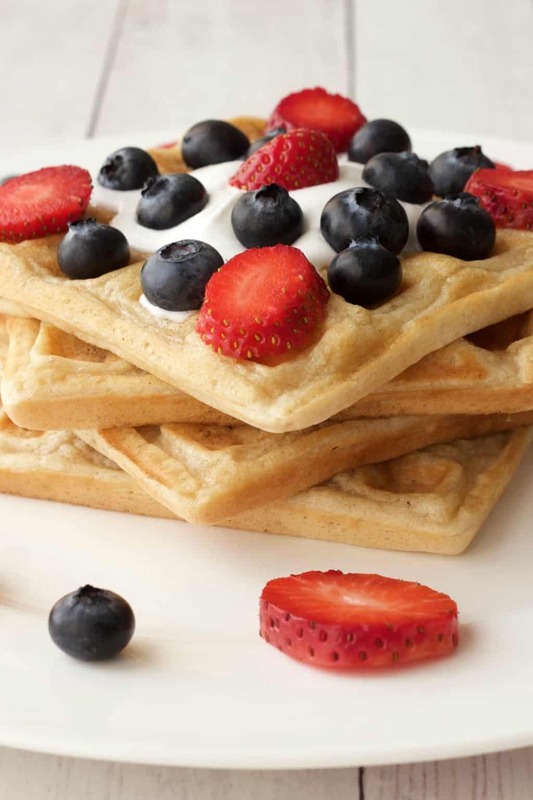 *Follow the waffle machines manufacturer instructions in terms of how much batter to use per waffle. *Also check your manufacturer instructions about whether or not to use non-stick spray. Some machines require it and some don’t.